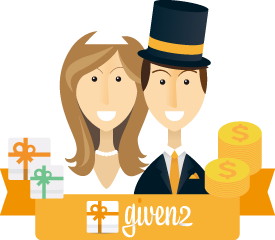 Given2 is the made in Italy Online Wedding Registry for 2.0 couples. It allows you to create a wedding registry in order to receive cash gifts into your bank account in an elegant way. With Given2 no limit is set to your imagination! You can create a wedding registry of any kind, ranging from a travel to the washing machine and, you can also add fundraising. Everything with no commision and with any kind of purchase obligation. The website of your wedding is ready, you can customize it and share it with your guests. It will be a simple communication tool to thank your guests for the received gift! In case you already have a personal website, no problem, you can easly incorporate the wedding registry into your website with the copy & paste function, like you do with a YouTube video. Gift amounts intended for your wedding registry are directly tranferred into your bank account via safe payment methods: bank transfer, cash gift, credit card, or PayPal. 3 simple steps to create your online Wedding Registry and your Website on Given2! Sign up for free on given2.com and start creating your wedding registry. Activate your gift registry for just the period you need to receive your gifts. How much does a Given2 Wedding Registry cost? The ultimate solution to the wedding registry dilemma! Imagine you can create a wedding registry to receive only money including both gifts available in stores and the honeymoon trip; not even the imaginary gifts are excluded! On the top of that, you can give your guests the possibility to pay via bank transfer, PayPal or credit card! More and more couples get married once they already bought everything they need to start their life together, so here are some pieces of advice if you want to create a wedding registry for your honeymoon trip. In fact, the wedding registry could be wholly dedicated to your honeymoon trip: a relaxing one for the lazybones, or an adventurous one for the sports couples! Plus, the creation of such registry can be fun! You can split your journey into steps and then add them to your registry with a brief description of every activity you plan to do: a nice way to involve your guests, and an extra attention to express your gratitude. For those of you who don't want to fill in every detail, an option is available to add the whole honeymoon cost in a single entry: it's like a fundraising, but aimed at reaching the amount you budgeted (or maybe a bit more, just in case). 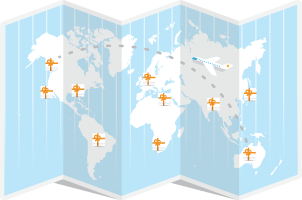 Therefore, if you want to go on the perfect honeymoon and travel to your favorite place, Given2 is precisely what you need!